Pete’s patient Patricia required a lot of foundation work before the Course. Patricia had a heavily restored mouth and she was really conscious of her smile. Certain old crowns had to be removed and investigated before hand. UR2 also needed a post. The case was treated in centric relation and the vertical dimension was increased slightly. The advantages of doing this included minimal preparations palatally for UR1 and UL1, and room for porcelain occlusally at UL4. A soft tissue laser was used to do the gum lift for certain teeth. Cosmetic contouring was done for the lower anterior teeth. Pete did a great job planning and treating this technically challenging case. Patricia was delighted with her final result – a very natural smile. After completing the upper eight teeth on the Course, Pete was set to help with other teeth that required restorative intervention. 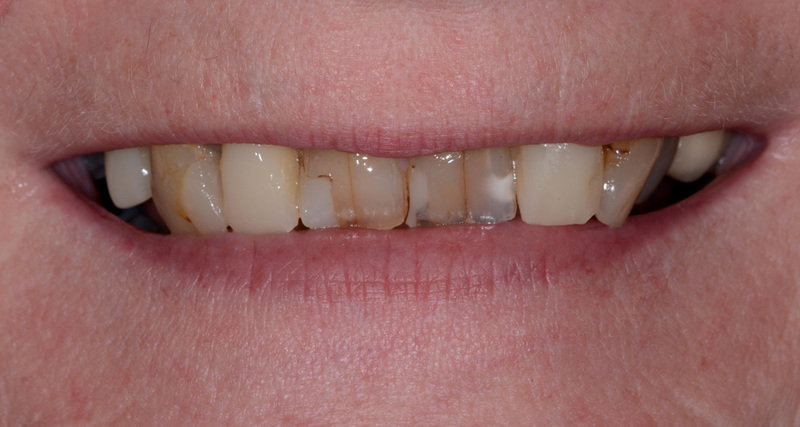 This case illustrated the importance of very good treatment planning, doing appropriate investigative work and the use of Smile Design principles to create an attractive and a healthy looking smile. Pete loved the Course and his patient was really appreciative of the hard work that went in to treating her.